A fascinating and complete overview of Churchill as Commander and a detailed study of how all of his unique and broad pre-WW2 experiences served him so well and contributed to the outcome of that great conflict. On a typical day during the Second World War, Winston Churchill, as Prime Minister and Minister of Defence, issued numerous memos to the ministers and service commanders on many different subjects, on both the grand strategy and the detail of the war effort. It was not just his work rate and his self-confidence which allowed him to do this. He had a unique and intimate inside knowledge of all three services which allowed him to assess their real needs - a crucial task when money, material resources, and especially manpower, were reaching their limits. No defence minister in modern times has faced such severe problems. No-one else has ever been able to balance the needs of the services in such a way - most of them came from outside with little service experience, while for those trained inside one service it is almost impossible to gain inside knowledge at a lower level without a bias in favour of one service or another. But Churchill's knowledge of the three services was almost perfectly balanced by his experiences since he first joined the army in 1896. He made his share of mistakes as a war leader, but this unique balance served him, his cause and his country well. 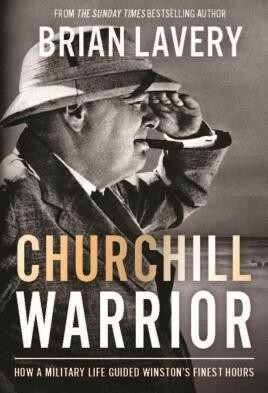 Churchill: Warrior looks at how Churchill gained his unique insight into war strategy and administration, and the effect this had on his thinking and leadership. Each period (before, during and after the First World War, and in the Second World War) is divided into four parts - land, sea and air warfare, and combined operations. The conclusion deals with the effect of these experiences on his wartime leadership. Written in Brian Lavery's acclaimed, insightful and anecdotal style, a grand narrative unfolds starting with the Marlborough toy soldiers and the army class at Eton, which then leads us through those early military and journalistic experiences, the fascinating trials and lessons of the First World War, the criticism, and his tenacity which came into its own during the Second. It explores how some of Churchill's earliest innovations were to bear fruit decades later, how his uncompromising, but uniquely informed, hands-on approach, and his absolute belief in combined force in Normandy, led to a systemic victory against the odds. Sir Winston Churchill's admirers are currently spoiled for choice...Churchill Warrior's author, Brian Lavery, is one of Britain's leading - and most readable - military and naval historians...5 stars. The book's great strength is its clever intertwining of the existing secondary literature with a host of archival sources...this is an excellent addition to a crowded field, that provides much-needed analysis to an aspect of Churchill's leadership often taken for granted.